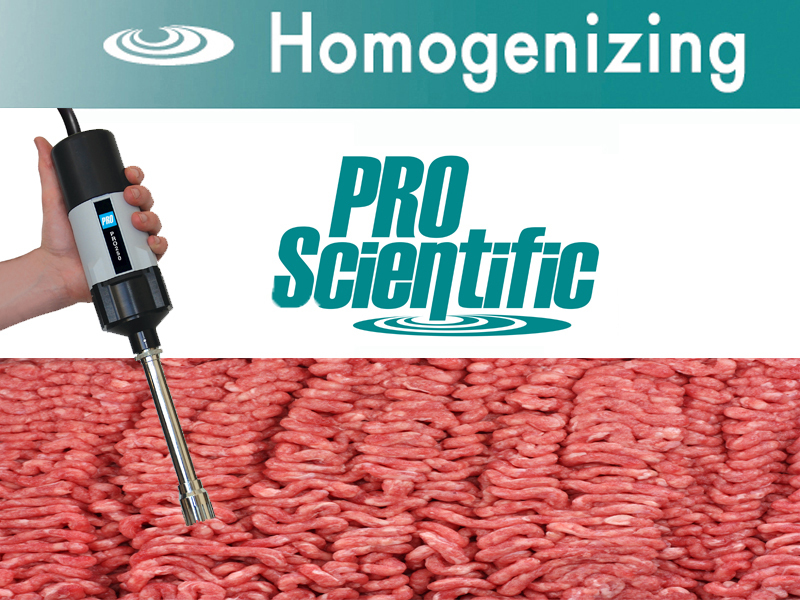 PRO Scientific Homogenizers are ideal for the homogenization of raw animal proteins. Homogenization of these samples allows for prepping samples of raw materials to test for moisture, fat, protein and ash. A range of setups are available depending upon your desired result and processing requirements. With the addition of liquid medium, a PRO250 or PRO25D Homogenizer and PRO rotor-stator homogenizer generator probes can effectively and efficiently breakdown meat samples. PRO rotor-stator homogenizer generator probes are precision crafted with a very narrow clearance between the inner rotating shaft and outer tube/chamber. This allows for quick, effective and repetitive processing, meaning you will get the results you want each and every time. When sample integrity is of an utmost priority and you cannot dilute or change the composition of the raw materials in any way the PRO250 or PRO25D homgoenizer and PRO rotor-stator homogenizer generator probes can effectively and efficiently breakdown meat samples. PRO rotor-stator homogenizer generator probes are precision crafted with a very narrow clearance between the inner rotating shaft and outer tube/chamber. This allows for quick, effective and repetitive processing, meaning you will get the results you want each and every time. For larger samples, the PRO250 or PRO25D Homogenizer along with a PRO Cryo Generator Probe provides shearing with blades within a caged system. When it is necessary to breakdown all fibers, even those of some of the toughest samples, like ground turkey and in large quantities, a two-step approach to homogenizing is often needed. The PRO250 is used with a PRO Safety Sealed Assembly and PRO rotor-stator homogenizer generator probe. Together, these homogenizing accessories can effectively and efficiently breakdown meat samples and fibers in a large volume. PRO rotor-stator homogenizer generator probes are precision crafted with a very narrow clearance between the inner rotating shaft and outer tube/chamber. This allows for quick, effective and repetitive processing, meaning you will get the results you want each and every time.